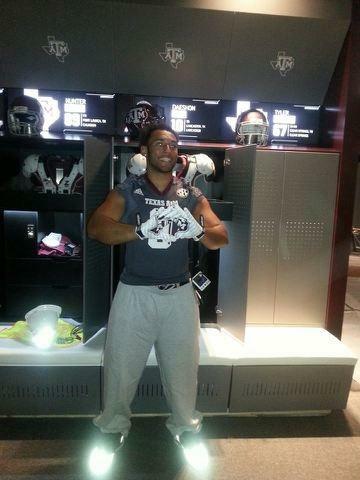 The Aggies have picked up another commitment, this time from the state’s top defensive end James Lockhart. The consensus 4-star recruit out of Ennis, TX projects to play strong-side defensive end at the next level. Lockhart holds over 25 offers from some of the top programs around the nation. He picked A&M over Alabama, Florida St, Ohio St, Oklahoma, Stanford, and Texas. Lockhart checks in at 6’3” 260lbs and boasts a 4.69 second 40-yard dash, 32 inch vertical, and can squat 600lbs. During his junior season, he tallied 122 tackles, 8 sacks, and 3 forced fumbles. Perhaps his best attribute is his ability to track down ball carriers in the open field. His run defense is very strong, and he uses a bullrush technique to consistently make his presence felt in the backfield. Since he does not have an elite first step or wingspan, he does not figure to be the pass rushing type. However, he could prove key to a run defense that wants to escape the cellars of the SEC. Coach Sumlin continues his streak of adding top talent on the defensive line. In the 2014 class, A&M secured commits from the state’s top 2 defensive tackles (DeShawn Washington & Zaycoven Henderson) and the #1 player in the nation in defensive end Miles Garret. The pipeline continues to build in the 2015 class with 5-star standout Daylon Mack and now James Lockhart. Furthermore, Coach Sumlin has now won 13 of 15 head-to-head recruiting battles against Texas’ head coach Charlie Strong. He continues to prove time and time again that #WRTS.